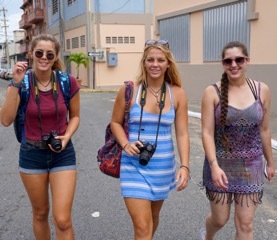 For my birthday yesterday we thought we’d explore Old San Juan. The Ford Expedition we rented from Target rental has been perfect for our sized group. 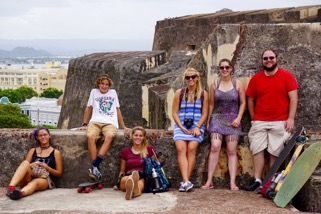 Our first stop was to Castillo San Cristobal, built by Spain to protect against attacks on San Juan. 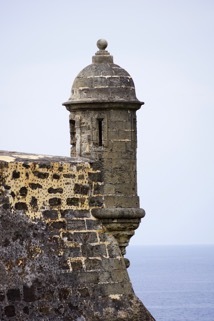 It was finished in 1773 and covers about 27 acres, and is the largest fortification built by the Spanish in the new world. 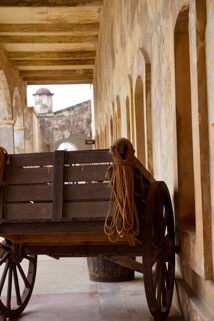 In 1521 San Juan was founded by Spanish settlers from Caparra. In 1595 the English attacked and failed miserably, and when fleeing took some prisoners but no treasure – which is what they were after. They attacked again three years later and failed again. 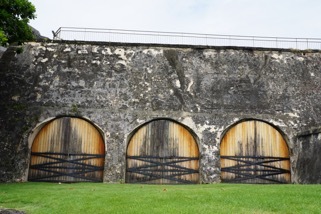 Additional construction was added to the fort. 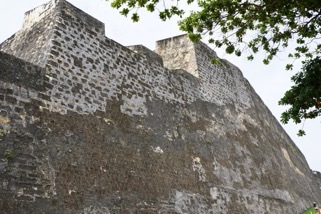 In 1625 the Dutch attacked and took San Juan from the land side and constructed large forms of defense on the land side to prevent attacks from there. While walking through the vast tunnels, one can’t help but notice how solid and permanent the structure feels. 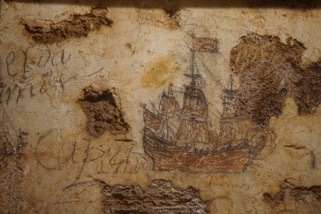 In the dungeon, drawings on the walls can still be seen, where prisoners sketched ships and wrote of their travels. Some of the large rooms have big openings, allowing the cool ocean breeze to enter. In the central court yard, you’re completely protected by towering walls. In the upper open areas that overlook the ocean, huge piles of cannon balls are neatly stacked and ready. We watched over the wall facing the ocean as a Coast Guard helicopter demonstrated the retrieval of a victim. While in the lower court yard we saw an iguana, and watched him for a few minutes. Looking through one of the arched windows into Old San Juan we could see the huge crowd gathered to watch an airshow. 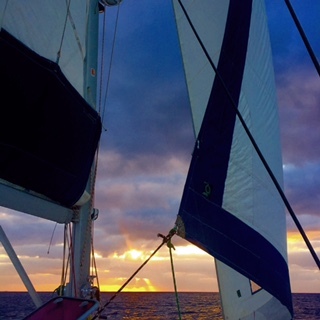 We walked out and down the streets paved in blue bricks, which are from the ships ballasts. Airshows are always a family favorite for us, and leaves everyone wanting to take flying lessons from Danny. The streets of Old San Juan are lined with colorful homes in neat rows – all connected like a giant assortment of crayons. 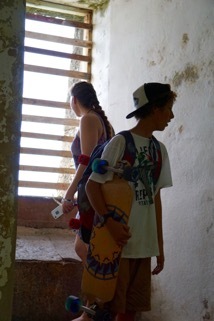 Danny, Jake and Aidan rode their skateboards all over th place! Emma and Jude showed us some of their skills too. We ate passion fruit and coconut ice cream from a friendly street vendor, and a man walked up and placed two iguanas on Kjira’s shoulder. Kjira and Mycah compared skin shades and decided that Alaska has left Kjira whiter than ever before! We had such an amazing day with our creatures, and love them so much. What a fantastic group of individuals!! !